Having been to Mix06 I knew that there were going to be a lot of cool things coming out this year too. So I’ve been following closely Mix07, although I didn’t manage to go this year and I must say that I’m pretty excited with all the things announced (although some were expected 😉 ). 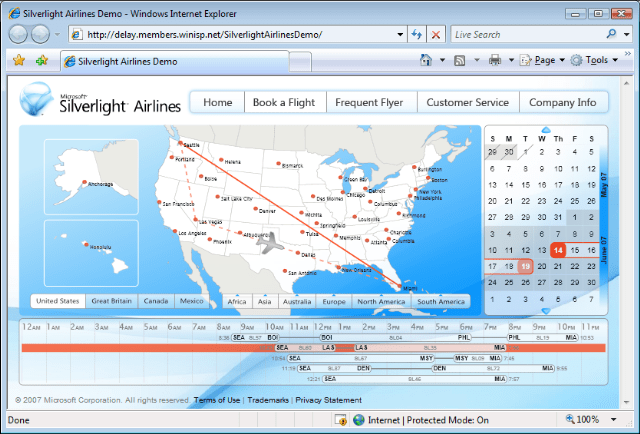 One of the coolest demos I’ve seen so far is the Silverlight Airlines application posted by David Anson. I just hope that it will work for Europe as well as USA soon. Check it out. i am not able to see demo. some parsing error in xaml file at line 10 position 15.